If you do a lot of translating of documents, Google has something called the Google Translator Toolkit, which can help you organize and edit your translations. It uses the Google Translate engine, which searches the Internet for accurate translations and applies them to your documents. When you upload a document to be translated, the toolkit automatically translates and saves the document for you. Then, you can open the translation and edit it. Google Translator Toolkit, contrary to what the name kind of implies, is not software that you download and install on your computer. It’s a web-based application, just like Google Drive or Gmail, which lives on the Web. You have to use through your Web browser. The main advantage is that you can access the toolkit from any computer, whether you’re at work, at home, or at the library. When you upload a document, Google gives you the option to purchase a translation of the document from one of its partners. Consider this very carefully. Your document is translated for free by Google Translate when you upload, so don’t think it hasn’t been translated. Google’s translations are okay for casual use, so you don’t really need pay for a translation. However, because Google Translate is not perfect, you may want to purchase a translation for something official or business related. It’s your call, though. At the bottom of the page, click Translator Toolkit. 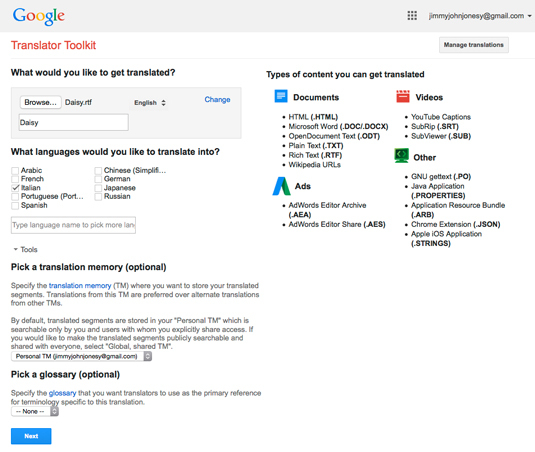 Log in to the Google account you want to use with the Translator Toolkit. On the Welcome screen, type in your first and last name and click Continue. You then see the Translator Toolkit, which looks a lot like Google’s other web-based applications, like Gmail and Drive. To upload a document to translate, click the red Upload button. Click Add Content to Translate and choose Upload File. On the right is a list of file types that you can upload. Click Browse and find the file on your hard drive that you want to upload. Choose the language you want to translate the document into. Click Next. The document is uploaded. You’re given the option to purchase a translation from another company. Click No Thanks to allow Google Translate to handle the translation. The document appears in your list of active translations. Click on the document to see the original and translated text. Input URL: When you choose this option, you can type in or copy and paste a URL of a Web page, which saves that translated page in your active translations. Keep in mind that it will only translate actual text on the page; text that appears in images will not be translated. Input text: Choosing this option gives you a text box to type or copy and paste text into, just like on the main Google Translate site. The benefit of doing this here is that the translation will be saved in your toolkit. Input a Wikipedia article: If, for some reason, you want to translate a Wikipedia article, copy and paste the URL of the article. This may not be the most useful of options, because Wikipedia itself offers its articles in a multitude of languages. Pick a YouTube video: This option enables you to pick a video from your YouTube library to translate.